When did you first become aware of the Tibetan Book of Living and Dying? In around 1991 or 1992 Sogyal Rinpoche asked to look at some of the transcripts of Chokyi Nyima’s teachings on the Bardo Guide Book, which was based on Tsele Natsok Rangdröl’s “Mirror of Mindfulness”. That was the first time I heard that he was writing The Tibetan Book of Living and Dying and that he was doing a lot of extensive research for it, in addition to his practical experience with the material. After it was published, he came to Nepal to give signed copies to everyone. What do you think makes this book unique? The Tibetan Book of Living and Dying has been like a bridge that makes the traditional Buddhist teachings accessible for people. Dying is something that is very suppressed in Western societies. There is so much ignorance about death and the dying process both in terms of those who are dying and also for their family members. In the West, you die and then you go to heaven or you go to hell, but beforehand little is done to help the person become aware of what will happen to them. Nobody talks about the body, nobody talks about the process of dying, nobody talks about anything—it’s completely suppressed. Tibetan Buddhism has a very different way of approaching death, because it believes that consciousness carries on afterwards. So there are things that can be done to help before the person dies, as the person dies, and after the person dies. In the Tibetan Book of Living and Dying, Western care-giving and psychology are brought together with traditional Tibetan practices. In this book the traditional teachings of The Tibetan Book of the Dead are presented in a way that is easy even for non-Buddhists to approach. It is very comforting because people suffer a lot when family members die or when they’re dying and they need to be able to work with those feelings in a non-threatening way. In addition The Tibetan Book of Living and Dying was incredibly well-written. Aside from all the philosophy, the practices and the Buddhist connotations, it’s very easy to read. What role do you feel this book has had in translating Buddhist teachings into a modern Western culture? I would say that after The Tibetan Book of Living and Dying was published, all of a sudden topics that had been unacceptable became acceptable, and family members didn’t look as askance at their children or their brothers or sisters who were becoming Buddhists because they could see some of the benefit in such training. Furthermore, even though there are many Tibetan lamas in the West, very few understand Western minds. They present traditional topics in the traditional ways that not everyone can access. Aside from that, I’m also not sure how many have the dedication to establish the Dharma here. Sogyal Rinpoche understands Western minds and although he is very traditional, he presents these teachings in a very accessible way. He is similar to Chogyam Trungpa Rinpoche in his ability to find the dialogue that touches people, ignites and inspires them, but isn’t threatening to them. Of course there are other teachers who understand the ways of being with Western students, but no one has had the impact that Sogyal Rinpoche has had and continues to have. Though I can’t actually see what peoples’ aspirations are, I’d say that Sogyal Rinpoche seems to have the vastest aspiration and activity of any Tibetan Buddhist teacher now alive in the West. I think about this a lot, because we all think about how to establish the Dharma in the West, and I like the idea that we’re not dumbing it down or making it ‘Dharma light’. I like to think that Western people are still capable of accessing the same traditional kind of practices and ways of doing things, but just in a slightly different language. It’s mainly a matter of appearance and language, in my opinion. What was the special quality of The Tibetan Book of Living and Dying that allowed it to reach so many more people than most books on Dharma. Was it mainly a function of the language? I think it’s a function of not insulting peoples’ intelligence, and not deceiving them. Having published many books, Erik Pema Kunsang and I have been told that every book has it’s own karma, and the karma of the Tibetan Book of Living and Dying was that it would be widespread and reach people. The quality is undeniable, and I think it’s a testament to the fact that you don’t have to dumb things down, and that people are open and willing to relate to the Buddhist teachings very authentically. It’s the integrity of the material combined with Rinpoche’s presentation of it that really shines through, and I think people recognize that. I think this is a very topical issue because there is a movement among many in the modern world to water things down, and I don’t agree with this. What are the lessons that we can take away from the success of The Tibetan Book of Living and Dying? I think that Tibetan Buddhist teachers, as Sogyal Rinpoche has shown, don’t have to worry about telling the truth even if it’s in a way they think that maybe their audience doesn’t want to hear. I think that people do want to hear it, and that those people who are going to be sincere about it want to be treated with intelligence and integrity. Underneath all of this, of course, is an incredible compassionate activity that permeates all the words. Why else would something be so great if it weren’t for so much positive aspiration, loving kindness, and compassion? 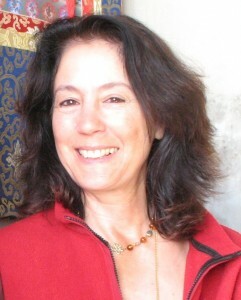 Marcia Binder Schmidt is a renowned Buddhist translator, editor, and writer. Under the guidance of Tulku Urgyen and Chökyi Nyima Rinpoches, she and Erik Pema Kunsang established Rangjung Yeshe Publications, which has published more than 62 books to date.She currently lives near Kathmandu in Nepal but continues to travel the world receiving teaching and transmissions from many Buddhist teachers as well as giving Dharma teachings herself in North America, Europe and other places around the world.